Anyway, we bought the ingredients and she made pea soup. In fact, I already knew it wasn't something she commonly made - I grew to like it after I was living on my own - it's not anything like a "nostalgia" dish from my childhood. But I was quite surprised when she announced, after we were eating it for dinner, that it was the first time she'd made pea soup. Yesterday morning, I went into Seoul. I travel so rarely, these days, even to just go into the city for a half-day - it was the first time I've left Ilsan since returning from my North American odyssey last November. My friend Peter is on the Peninsula, now that he's a grad student specializing in Korean Studies, he has reasons to come back to visit, and apparently he managed to make it quite affordable. We met in that area around Dongdaemun that I have always called "Russiatown" - it's one of my favorite neighborhoods in Seoul, with much of the same "international" or cosmopolitan feel of, say Itaewon, but without the pretentiousness or gentrification, and fewer "fratboy" tourists, as the US soldier-on-leave crowd in Itaewon always seems to come off as. Nevertheless, I would say that "Russiatown" seems a bit gentrified, lately, too. Anyway, my old standby, the Russian restaurant of the ever-changing name but fairly constant menu, was still there. Peter pointed out that it was in Russiatown in 2009 that we met for the very first time. I don't think I blogged that particular trip to Russiatown - I went rather frequently back in that era. Anyway, Peter and I had lunch at the restaurant, and then met a friend of his (colleague also enrolled in the same graduate program at Johns Hopkins, apparently) and went to Hongdae briefly, where I got to visit the Korean Language hagwon where Peter studied last year some. Peter is trying to persuade me, I think, to get more serious about my own regrettable progress in the language. Certainly I feel jealous of his amazing competence in the language relative to my own. Here are some pictures. I think Russiatown looks much more prosperous than it did 5 or 8 years ago. Still, there is much Cyrillic signage - not just in Russian but other central Asian languages typically written in Cyrillic, such as Mongolian, Uzbek, Kazakh and others. As I chatted with Peter, I coined a new name for the neighborhood: "Stanville." This reflects the Central Asian character as opposed to strictly Russian (all the "-stans" of the former Soviet sphere). Mostly, every time I buy some food item or attempt to cook some food item, out of craving or whatever, I am inevitably disappointed. Eating just isn't fun - not even the the easiest-to-eat foods, like omelettes or noodle soup (국수) or rice porridge (죽) - at best, they are utilitarian and serve the purpose of providing me with sustenance with minimal discomfort. Today, for whatever strange reason, I found myself remembering and craving the birria that I used to buy as a lunchtime snack at one of the puestos on San Cosme (in front of the subway station) where I lived in Mexico City. I suppose that birria (a kind of goat-meat soup or stew - which it is depends on consistency, and the kind I got was always more brothy than stewy) would be hard to come by in Korea in any event. So it's just as well that I mostly let these cravings just pass by. But it's a fond memory in any event. It's strange... the random stuff that pops into one's mind. I really miss eating spicy foods so much. And I have felt frustrated with the slow pace of my recovery. I think sparing spicy foods completely for so long has meant that I've lost my resistance, partly, so lately in an effort to somewhat "force" my recovery, I've been sprinkling a very light dose of red pepper on my food sometimes - trying to build up a resistance. Last month I made some pre-packaged instant curry and tried to eat it and it was a kind of painful disaster - even trying the "mildest" flavor available in the store. On Sunday, I did the same thing and it was tolerable. So that's a kind of food victory. If I can work up to the "medium" flavor of the packaged curries, I might brave a trip to my favorite Indian restaurant a block from here, and have "real" curry - as opposed to the rather lousy Korean-style you can get in the curries from the supermarket. Tomorrow morning, I go to the hospital for outpatient CT scan and such. I'll get injected, detected, inspected and hopefully rejected - to paraphrase and repurpose Arlo Guthrie's famous meditation on the draft. It's a follow-up appointment, at the 4 month-iversary of the end of my radiation treatment. I'm past the bad cold I had for almost a month, and I've been feeling healthier, but I still have some weird paranoia about my overall health. I've always suffered from what I call meta-hypochondria - which is to say, I worry constantly that I'm sick in some way but then always and inevitably dismiss those worries as hypochondria. The problem is that sometimes those worries are in fact legitimate, such as my eventual cancer diagnosis last June. So meta-hypochondria is just as bad a condition as hypochondria, probably. Two months ago on the 4th of July I had my tumor removed. Piece-of-cake. This radiation thing, on the other hand... eheh. But that's the deal-with-devil I made, I think. 화이팅. Last week I made a giant batch of pea soup - before what was left of my ability to taste food disappeared over the weekend. I finished off the leftover pea soup for lunch today with some cubes of ham cut into it, and imagined it was delicious. I just make myself eat, because I know there's a lot of concern about patients losing weight during radiation, and especially because of the sores in my mouth potentially disrupting my ability to eat solids. So far, I just kind of buckle down and push the food in, chew, swallow. It's doable. Talking is just as difficult as eating, now - in that respect, this is quite different from my experience last month with recovering from the tongue-reconstruction surgery, where I recovered the ability to talk almost effortlessly and painlessly, but re-learning to eat and swallow were quite challenging. Now, it's just that everything is so sore - tongue, inside of cheeks, gums, inside of lips, throat, etc. - that eating and talking are equally difficult and unpleasant. But, as I said, it's doable. I took a longish nap, after lunch. I guess I needed it. I always get hit really hard by tiredness around noon on my radiation days. The result was that I didn't go to work. I guess I could go now, but I had a talk with Curt on Monday about my not going in so much due to how I've been feeling about the treatment, and he was OK about it. I'm not really sure I have the right mental constitution to handle having an entirely "optional" job, though. It's easy to say, "Oh, I'm just not up for it." But then... my friend Seungbae wants to meet this evening for dinner, because it would be his chance to say goodbye to Andrew before Andrew goes back to the US at the end of this week. So that's another reason to skip work. But I have that same guilty feeling skipping work and going to see a friend in Seoul as I used to get being "sick" from school as kid when in fact I was taking a mental health day of some kind or another. I'm not sure I'm really going anywhere with all of this. Just rambling on, letting everyone know where things are at. Document everything! ...My life of obfuscating, radical transparency! Parov Stelar, "If I Had You." Here is a picture of magpie (까치) I tried to capture while walking back from the hospital this morning through the park, with only mediocre success. Earlier today, after breakfast, I was feeling energetic and restless, and I said to Andrew, I'm going to take a walk. He came along, of course. We walked over to the new "Onemount" mall that's been built on the west end of Lake Park, a few blocks from my apartment. There is a waterpark inside the mall. That's pretty common in Korea - waterparks, I mean. But there is also a "snow park" in this mall - ice skating, manufactured snow, an indoor sledding slope. That's not so common. I think some hot day I'm going to pay the entrance fee and try it out. Then we walked into Lake Park. That's a common enough walking route for me. The air was stormy and thundery and deep gray overcast. It was beautiful. And there was enough of a breeze that the heat wasn't so stifling. I knew there was a "toilet museum" inside Lake Park - I'd seen it before. But I'd never actually visited it, although it's a kind of famous (or infamous) landmark in Ilsan. Today it was open as Andrew and I walked past, so we visited the Toilet Museum. Then we saw some men running one of those sewer-exploring robots - just something in maintenance going on unrelated to being next to the Toilet Museum. We watched them for a while - they seemed disorganized. We walked toward the southeast end of the lake. That area looking toward the highway bridge over the lake always reminds me a little bit of Minneapolis' Uptown area. Then we walked around the end of the lake and ended up going to HomePlus, where I bought some vitamins and exotic tea and a few other things. Then spontaneously I said, "How about instead of going home for lunch we go to that Indian Restaurant that I like that's near here?" Andrew seemed to like this idea. So we had Indian food for lunch: samosa, vegetable raita, malkhi dal, some mutton curry, lots of garlic naan bread. Very delicious. It was pouring rain so hard when we left the restaurant that we stopped in a cafe and had coffee and talked for a long time. When the rain had let up and we finished our coffee, we hurried home and I quickly got ready and went to work. Work felt good today: I felt useful. I did a substitute teaching in one class, because of a scheduling mistake. Then I corrected some student essays and helped fixed the scheduling mistake. One thing having a visitor (namely Brother Andrew) here has done is that it's ignited my cooking bug. I love to cook, but I often get into lazy ruts of way-too-simple foods when living alone and cooking only for myself. Having someone here, I start getting creative. Yesterday I made a really tasty tuna salad for lunch, with chopped almonds and an aging nectarine, and ginger and mayo and blackberry vinegar and some leftover curry spice. We slathered it onto Russian rye bread (bought in Russiatown on Wednesday), sliced and toasted. It was hard for me to eat (the toast too crumbly = tongue steering crisis) but very good. Then for dinner last night I made wilted spinach - in a pan with a few tablespoons of oil, I fried up some onion and chopped almonds (yes I'm getting rid of too many almonds) and lots of garlic and some spices, then added the spinach and turned off the heat. The spinach wilts in the garlicky juices but doesn't "cook." I boiled some tricolor rotini pasta and chopped in some tomato and added a cup of store-bought alfredo sauce from a jar and ground nutmeg. It was highly delicious - my best cooking since leaving the hospital. This was a milestone day because it's the first day I didn't really take a nap. I was pretty tired this afternoon after Andrew and I walked around a bit too ambitiously this morning, but when I lay down to nap, my mind was racing and so I decided to just try to forego the nap. I'm trying to get away from the wake-up-every-2-hours hospital style sleeping pattern. Maybe (hopefully), I've exhausted myself enough that I can sleep a full, more-or-less normal night tonight. I made some pasta with broccoli and red-sauce, with some butter and basil added. Andrew ate it ("put it in his face" in his parlance), and even smiled. And then he did dishes. I was craving the making of things. I was trying to get back on my regular schedule, with the "dinner" meal at around 11 pm, because that's when I get off work, normally. So after a 4 km walk with Andrew in the misty, humid hot darkness around part of the lake at Lake Park, we came back, took the stairs to my home on the 7th floor, and suddenly, I was in my kitchen making salad. Ah the joys of normalcy. We have a lot of leftover fruit from the hospital. I decided to start with a chutney instead of making a dressing. I chopped some apple, carrot and nectarine into a squirt of Korean blackberry vinegar and a few tablespoons of grapefruit juice from a small juice bottle I'd bought earlier. I added some powdered ginger, some dried mint leaf, and a dash of clove. stirred together, it makes a simple chutney. I washed off fresh spinach and added a few teaspoons of sesame oil, sliced in some cherry tomatoes and then ussd a few spoonfuls of this chutney to make for a perfect salad. The stems proved challenging to my chewing mechanism - the eating was, like many eatings, a slow slog. But it was a damn good fresh spinach salad, and the making of it was even more satisfying, still. ever since my major surgery i have been craving fruit: apples, peaches, blueberries, apricots, even fruit i dont normally prefer, like plums and grapes. andrew and my friends have been accommodating, too, so ive been eating a lot of fruit. this evening my friend seungbae stopped by and brought even more. i consumed a peach and some watermelon. what i wonder is what this craving represents. ive always believed that strong food cravings generally mean the body knows about something it needs. what does the fruit represent? what im listening to right now. Foster the People, "Helena Beat." its not that i forgot the tastes. but with a reengineered tongue and mouth, my face must have been like a babys that first time you give them some new thing to eat. its not the taste thats blowing their minds but rather their efforts to sort out how to control this new object placed there. theres a lot to sort out . . chewing, but not so much as to chew the tongue, then steering the pieces gradually backward and toward the right tube at the back so as not to choke. imagine youve lost all of that automatcity . . . every bite takes several minutes to sort through. i still bit my tongue once. 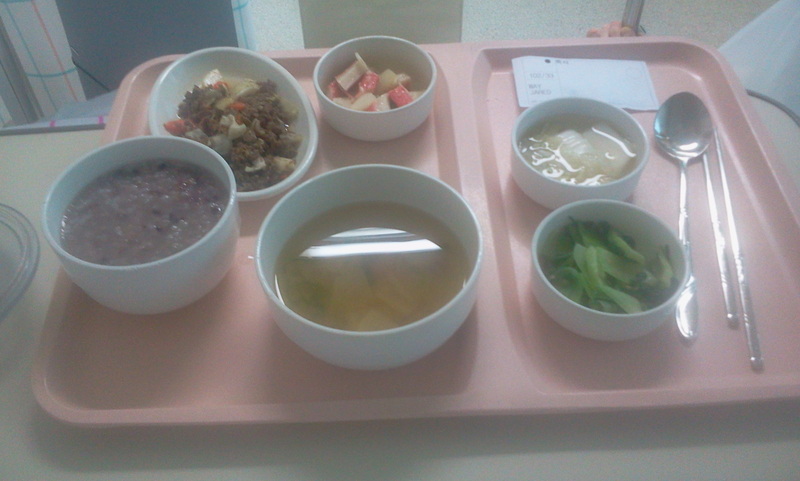 they gave me juk (rice porridge), fish broth, some finely chopped beef with cabbage and carrots, some fake crab salad, white kimchi, and greens. i managed about 30 percent of the total, focused mainly on juk and fish broth. 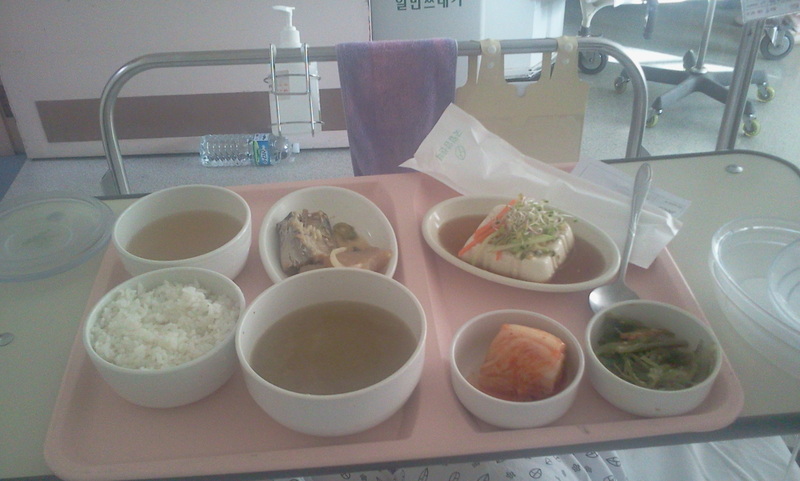 i ate everything but the kimchi (too spicy for the wound in my mouth). fish, pickled greens, tofu with soy dressing and slivers of vegetables, rice, some kind of earthy tea, and front center a diverse mushroom soup. koreans have a wide variety of various fungus they eat. the food was good. It was raining. I saw some early spring blossoms on this tree - I haven't seen much blooming yet around here, so this is like a "sign of spring." I was walking along the Juyeop esplanade thing, homeward, and noticed a new tower had sprouted down at the south end of things, across the western end of Lake Park (behind the big flagpole in right upper quadrant of photo). I guess it's been a few months since I walked this route - I wonder what that new tower is? As has become a sort of Saturday evening tradition, lately, for me, I made some 죽 ([juk] = korean rice porridge). But I tried something new: I toasted some black sesame seeds first in a dollop of sesame oil, with some of the rice gluten powder that makes juk juky. It turned everything brownish and gave it a very toasty flavor. The week isn't over yet, but, despite promises that the workload would lessen with the advent of the new school year and a new schedule, I've put in more hours this week than at any time since I was covering for both Grace's schedule and my own last summer - and that was only temporary, whereas this state of affairs is looking more and more permanent. And I have a full day's of work ahead of me tomorrow, too. I'm burning out. This was the kind of stress-driven burnout that lead me to abandon LBridge, in 2009. I'm considering long-term options. Meanwhile, I came home craving something disasterously caloric. I made a cheese, mushroom, onion and tomato omelet. It was really good. Not really very healthy, though. This is why I get fat when I'm stressed (and hit 260 lbs while being a computer programmer, last decade), and why having a high-stress job doesn't work for me, health-wise. It's not workable for long-term sustainability. Young Empires, "The Earth Plates Are Shifting." I tried making my own 야채죽 [ya-chae-juk = vegetable rice porridge] today, from scratch. I've never made it before. I've never watched it being made. I was put off by the various recipes I found for it - most required lots of soaking and cooking and blendering, etc. I figured it should be simpler than that. I chopped up some veggies: mushroom, carrot, squash, onion. I added some pine-nuts. I stir fried these in some sesame oil with some seasoned laver (김 [gim = seaweed]) which provided enough saltiness, along with a dash of soy sauce and a dash of ginseng vinegar (I don't know why I added the last - because it was there?). I took out the veggies from the fry pan, added water to the pan, making a broth, and then added some already-cooked white rice. I stirred the rice and broth and mashed up the grains vigorously in the pan with the boiling water on a medium heat for about 5 minutes, and it got creamy, like rice porridge (juk) should. Then I added the vegetables back in, stirred, put in a bowl, topped with garnish of some additional gim, and voila. Prep time was only about 20 minutes. I won't say it was as good at the juk you can get at the joint downstairs. But given the fact that I made it, as an experiment, with no recipe and having never done it before, it was pretty darn good. And vegan and nutritious, too. 시인과 촌장 [si-in-gwa chon-jang], "가시나무 [ga-si-na-mu = thorn tree]." No es lo que pensaría. Sólo que hice compras ayer y ví en el supermercado yerba mate (en saquitos de té). Lo compré por lo novedoso que era. Korea has this consumer product called "drinking vinegar." You dilute it with water, and enjoy the acidity of it, I guess. Lately, I've been drinking it. Is this another part of my periodic flirtations with "becoming ajeossi"? [ajeossi = "uncle" AKA generic middle aged Korean man]. Well, whatever. Today is Korea's Memorial Day holiday, but I'm going to a work-related social function. I've posted before about my habit of sometimes pursuing rather random culinary undertakings. Today I attempted to make a vegan curry from scratch (even making my own curry powder). I attempted to use some tofu I had... I breaded it and fried it up in a style similar to abura age (as in kitsune udon). When the tofu was fried it was quite tasty (see picture below), but when I added it to my curry, it got rubbery. And the balance of spices in my curry was off, too. So it was a rather atrociously mediocre creation. Frankly, "Riceball & Tortilla" sounds like the ill-conceived name of a 1970's TV dramedy with a politically-incorrect ethnic twist, perhaps in the buddy-cop genre (e.g. Starsky and Hutch, Cagney and Lacey). Instead, it's the name of a fast-food joint in my neighborhood. One of my coworkers brought me something from there - a 주먹밥 (which I've blogged before) but coated in something vaguely resembling corn meal instead of seaweed - I guess that's the "tortilla" part of the name. In Korean, it's named 주먹밥&또띠아 전문점 [ju-meok-bap & tto-tti-a jeon-mun-jeom = riceball & "tortilla" specialty shop]. Here's a picture of the container. I ate the actual riceball before taking a picture - sorry. It's not bad. I like the kind with seaweed on the outside, better. The Avalanches, "Frontier Psychiatrist." This song was on the radio in 2001, I think. I associate it with living in Burbank, California, and driving on the 134 toward Pasadena to visit my dad. I imagined going to visit a frontier psychiatrist, who would help me in some difficult-to-define but appropriately frontiery way. The video is pretty entertaining, in and of itself - I can honestly say I never saw it before right this moment. I made a Tomato & Yogurt Curry from a pre-mix ("seasonings only") package, earlier. This is quite adventurous, since the directions on the package are entirely and solely in Korean (see right). So it was a cross between a Korean Language lesson and a cooking class. I wonder if this has potential as a means of motivating me to study Korean better. I kept confirming my understanding of instructions and vocabulary with a dictionary and/or googletranslate, worrying I wasn't making it right. But the basics: veggies and potatoes (I left out the meat called for in the recipe), boil in the first packet of mix, add the second packet, then the third, serve over rice. Here it is. Dot dot dot. Life, it turns out, goes on. I made curried broccoli, using some Thai green curry paste and spices and onions and coconut milk. I finally ran across some beets during my most recent visit to the Orangemart supermarket across the street. Grace had told me that they had them, but I had never managed to see them until this time. Maybe it's a kind of sometimes thing. I love beets. And beets make me think of borshch (or borsht or borscht, Борщ). So I made borshch. I didn't follow a recipe. I'd been reading a while back about a way of making it where you oven-roast the beets and potatoes first, to carmelize them slightly and give them a stronger flavor. I don't have an oven - I don't even have a microwave - but I was trying to think of ways to achieve a similar carmelizing effect. Here's the recipe I made up as I went, with occasional illustrations. I peeled and cut up one large beet into thin bite-sized slices. I did the same to one carrot and two smallish potatoes. This seemed about right for one "batch" which I imagine will be three servings for me. I sliced two small white onions and added a few cloves of crushed garlic to a pot and began to fry them in about a tablespoon of canola oil (I have a several-years' supply of canola oil, as several bottles came embedded in my Seollal gift-set from my boss this year). I added the chopped beets, carrots and potatoes, and some spices. I used ground bay leaf, thyme, oregano, dill seed, a dash of salt, black pepper, a squirt of lemon juice, a teaspoon of brown sugar (to bring out that carmelized beet and onion flavor, right?). Then, I "stir fried" it all on a low flame. I didn't add any additional liquid. I figured when it started to burn, I would add the liquid, but I wanted to try to get the carmelizing effect. And much to my surprise, it didn't start to burn, for almost 30 minutes. The onions and beets and the lemon juice seemed to provide enough liquid to prevent the stuff from sticking to the pan. I stirred it a lot. The stuff cooked down a lot. It bubbled and smelled delicious. Finally there was some crusting on the bottom of the pot, so I added a half cup of red wine (which I keep for cooking and use when recipes call for vinegar). Then I added a cup of tomato juice - which is a great instant, convenient vegan substitute for any recipe that calls for broth or soup stock. This bubbled up and boiled I periodically added some additional water, for another 30 minutes. The recipe is purely vegan up to this point. I broke that rule because I put a pat of butter on it and sprinkled some dried thyme, for serving it. I didn't have any sour cream or yogurt on hand, which is what you're supposed to put on borshch. Borshch always makes me think of Doukhobors. Doukhobors are like slavic Quakers (and there's an important link to Tolstoy). I like Doukhobors. If I had to be a Christian, I would have to be a Doukhobor, maybe. The name means "Spirit Wrestlers." The personal connection, for me, was in the summer of 1989 when I made a road trip with my brother and father in the moonwagon (my dad's 1949 Chevy suburban) from Minnesota to the Kootenays region of British Columbia. My father spent some time during his childhood there, in a Quaker semi-utopianist community named Argenta, that was linked to the one his parents had founded in Southern California. There are a lot Doukhobors in that part of Canada, and we visited someone who served us home-made Doukhobor borshch, which is one the most delicious meals I have ever eaten in my life, perhaps in part the context, but truly good food, too. Ever since, I keep trying to reproduce that experience, which is why I so frequently obsess on borshch-making. And as a stunning non-sequitur, I offer: what I'm listening to right now. Mexican Institute of Sound, "El micrófono." Que chango tan chistoso, ´nel video. There is really nothing quite like sitting in a cozy apartment on a frigid February day, in Northwest South Korea, eating homemade borscht and listening to Mexican techno.